One of the best things about Instagram is that it allows me to discover new pieces. I’ve lost track of the number of fashion pictures I’ve liked that detail unique necklines, exquisite embroidery (I’m looking at you Georgina Chapman!) and must-have pieces that scream ‘buy me!’ One of the worst things about Instagram is that too often, I fall in love with items waaay out of my budget. This happened recently when someone posted these Dune plimsolls. Fringe, embellishment and suede? I wanted them. But (I see a theme emerging here…) I wasn’t prepared to sink £80 on a pair of slip ons when I knew they could be recreated for a fraction of the price. And what could be better in today’s Instagram brag culture than posting a pair of kicks with the caption ‘I made these’ *cue adulation*? Don’t be put off by the number of steps in this tutorial. It’s like a Jamie Oliver 15 minute meal – once the ingredients have been prepared, the assembly will be speedy. 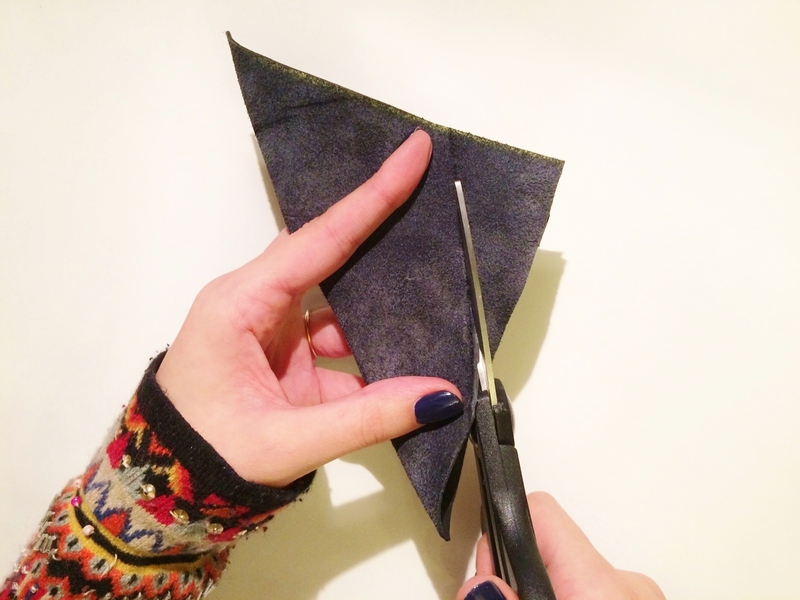 Cut your leather into four squares: two small and two large. I had two squares measuring 14cm x 14cm, and two squares measuring 12cm x 12cm. 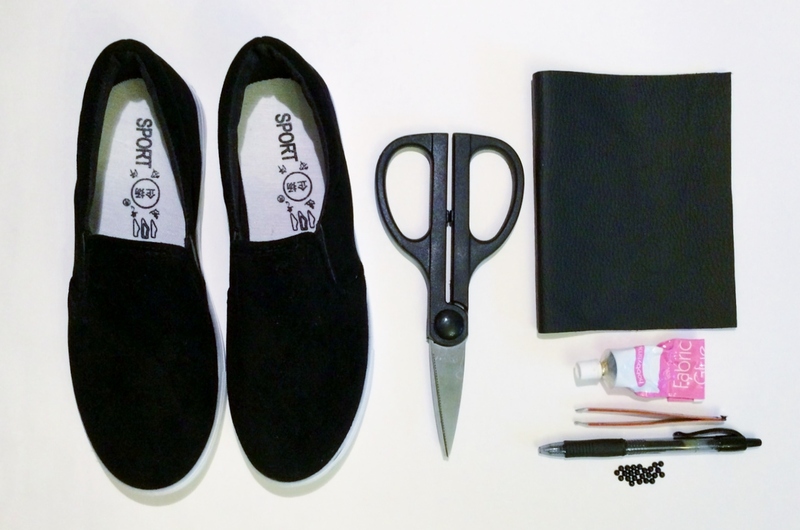 To mark where the fringe will go and what size it needs to be, use the shoe as a guide. With the suede side of the leather facing upwards (so that any marks that arise throughout the tutorial are ultimately hidden), position it on the shoe so that the corner is aligned with the centre of the shoe. From a birds eye view, the square should look like a diamond. Tuck the top corner into the tongue of the shoe. 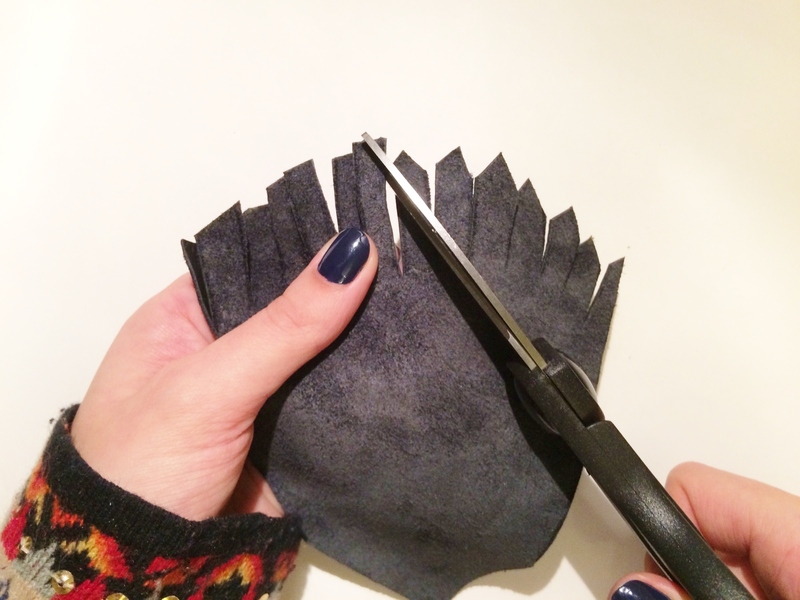 Now you are able to mark the shape the fringe will be onto the suede. 2. With your shape defined, cut the leather along these lines. 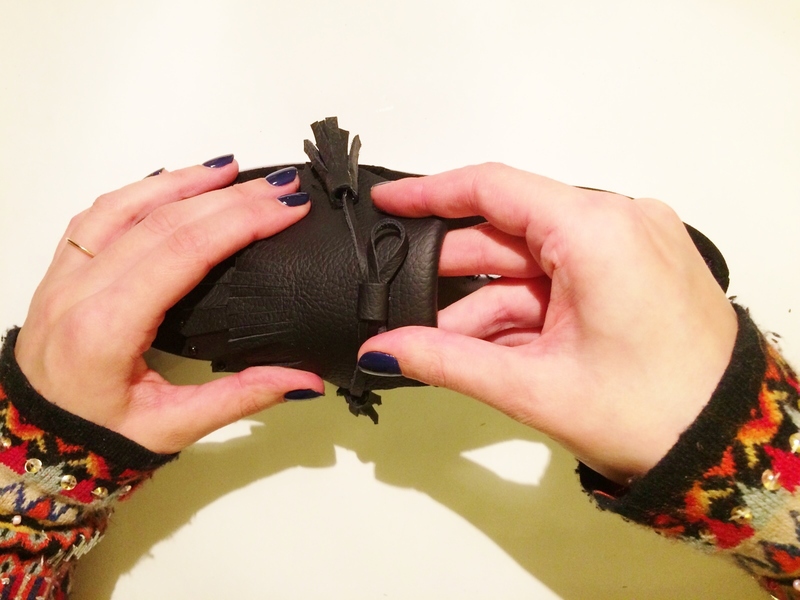 To ensure symmetry, fold the leather in half. 3. Repeat steps 1-2 for the smaller square of leather. 4. Now that your leather shapes have been defined, mark on the suede side of the leather your fringe. In keeping with Dune’s Erynn plimsolls, I made the fringing on the bottom layer of leather wider than the fringing on the top layer of leather. 5. Cut along these lines to create the fringe. 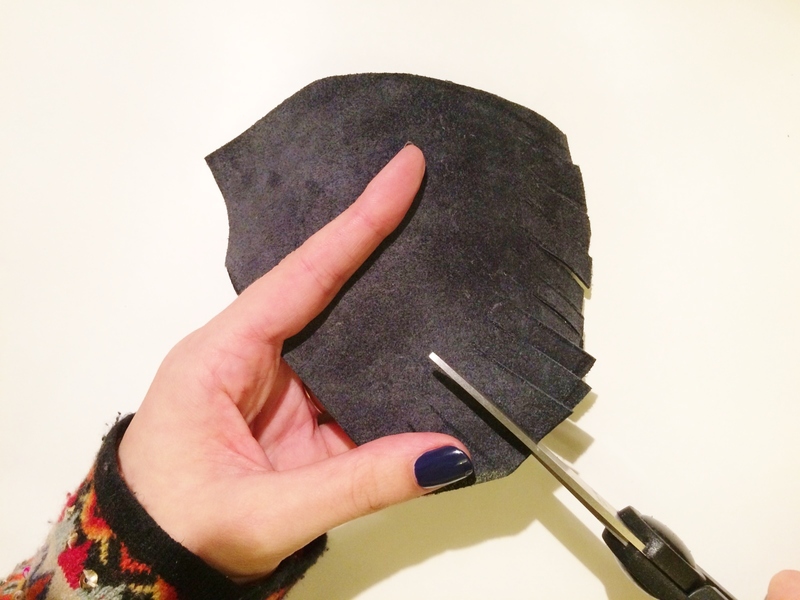 For a clean finish, make sure that the fringe begins at the same point in the leather. 6. To emulate the pointed fringe of the Erynn plimsolls, cut outwards from the middle of each strand of fringe at a 45° angle. 7. 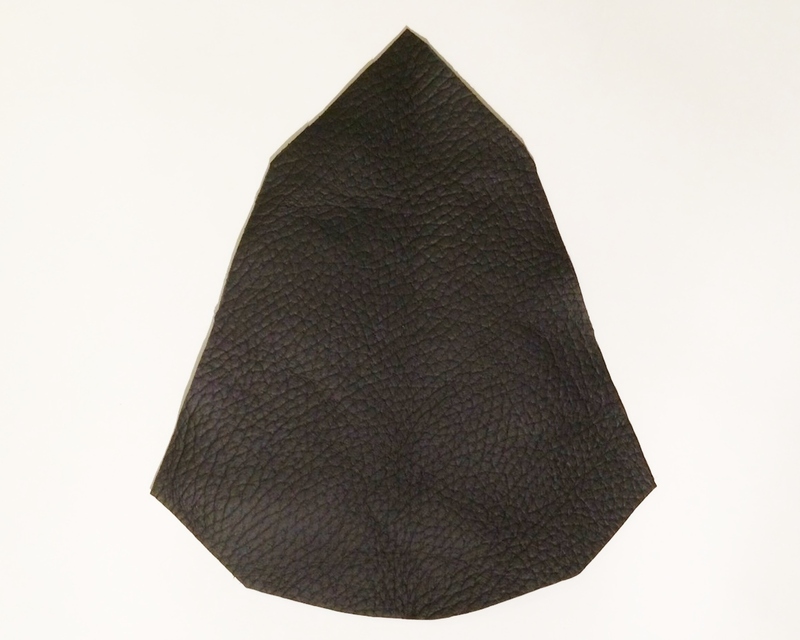 Turn your material over so the leather is facing upwards. Prepare a swatch of tinfoil and pour a small amount of fabric glue onto it. Wait a few seconds for the glue to go tacky (as you would if you were applying false eyelashes). 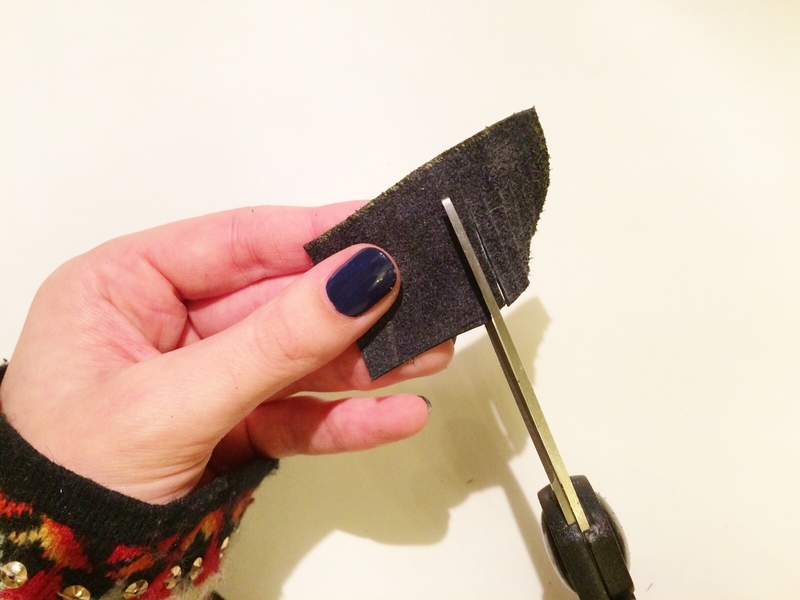 Using tweezers, pick up a cabochon, coat the back in glue and press firmly into the centre of the pointed fringe. 8. 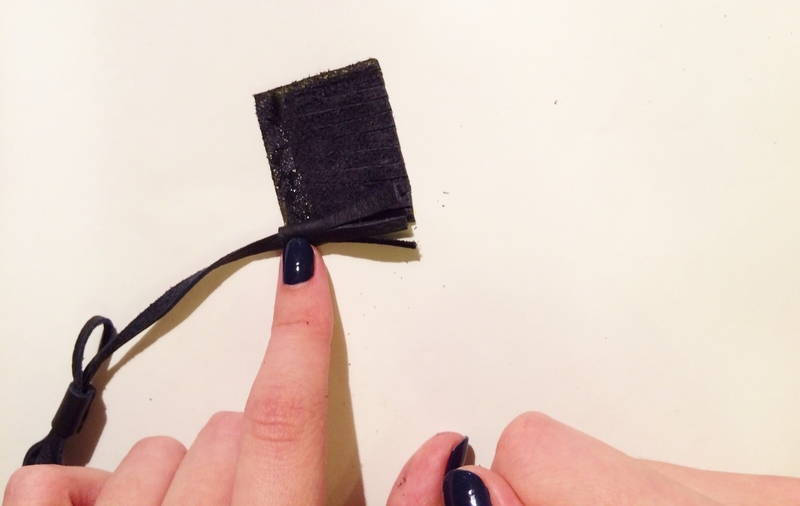 Whilst you wait for the glue to dry, cut four long thin lengths of leather from the remains. 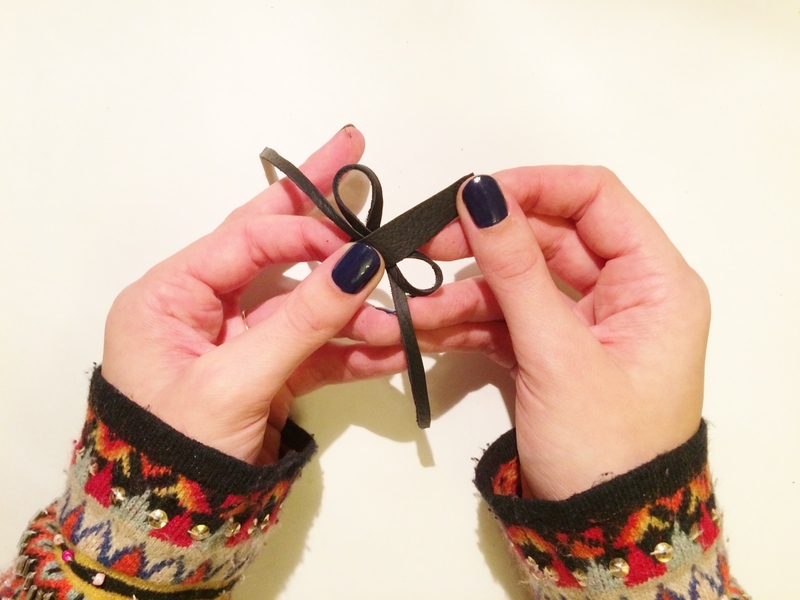 Arrange these into two bow shapes, and secure by wrapping a small rectangle of leather around the centre. Affix with glue. 9. 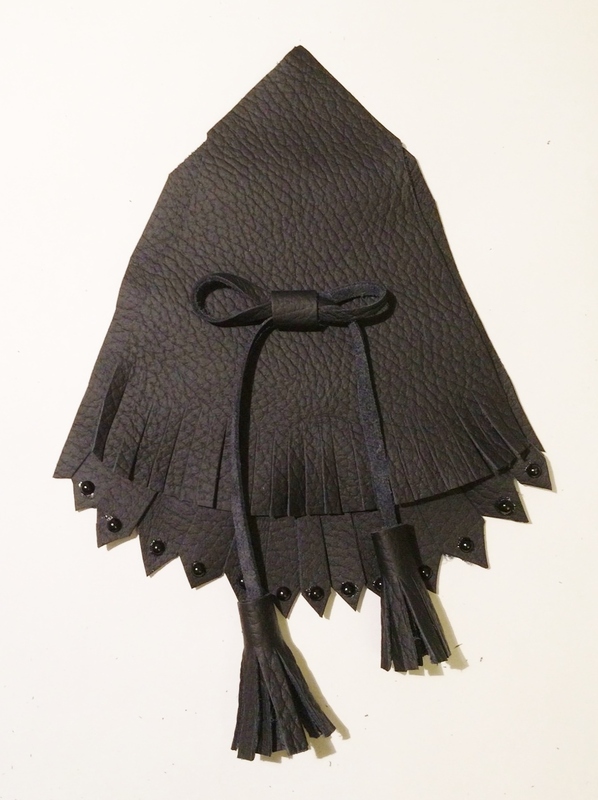 To create the tassels for the end of the bows, cut four rectangular lengths of leather (mine were approximately 4cm x 3cm). As you did in steps 4 and 5, create fringing. Remember to leave a length of about a centimetre at the top. 10. Dab the top of the fringe with fabric glue, align the end of the fringe with the end of the bow, and tightly roll the fringe up. Press firmly to bond the glue to the material. 11. 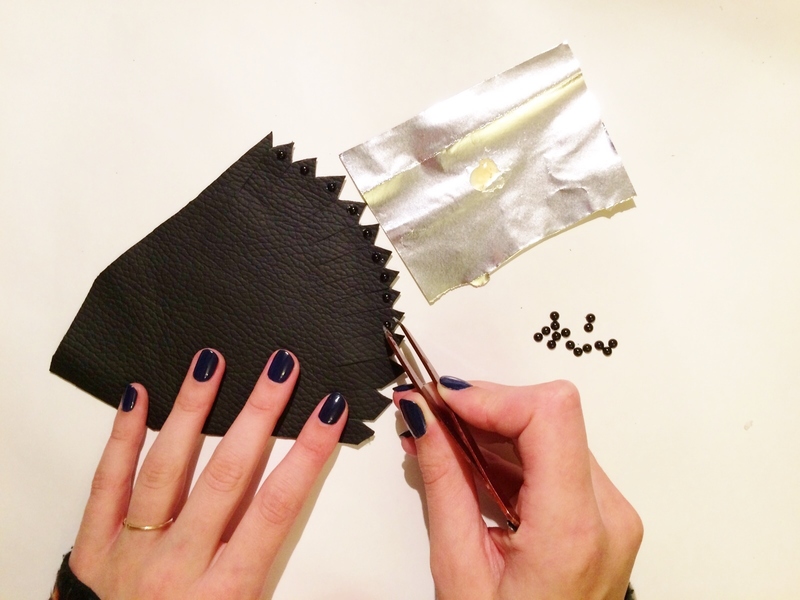 To assemble the leather pieces, place a liberal amount of glue at the top of the embellished pointed leather. Place the fringed leather on top of this and press firmly. Position your bow on the fringed leather and glue (remember to leave the length of leather at the top that will affix to the tongue of the shoe). 12. 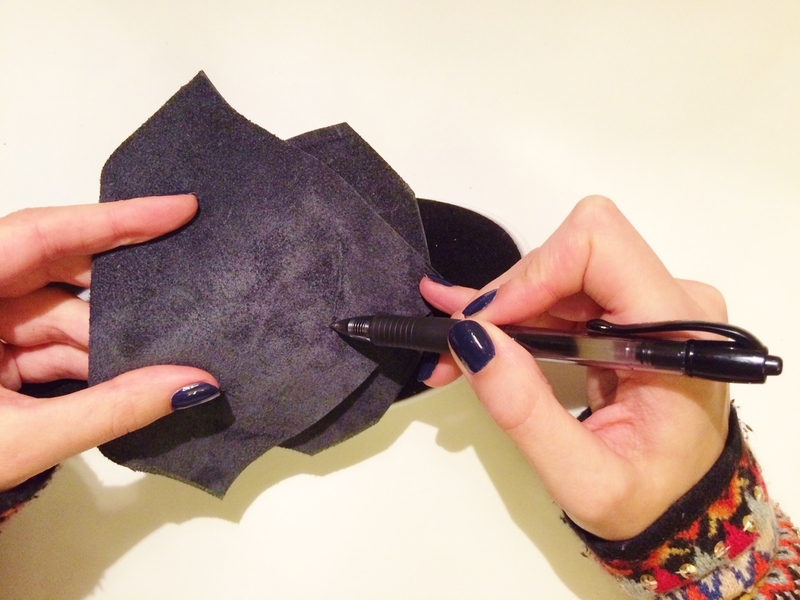 Turn your leather piece over and apply glue to the suede. Position this on the shoe and press firmly, especially under the tongue of the shoe. Leave to dry.